Iron deficiency anaemia is not an uncommon disorder. A large number of population is of developing countries such as Pakistan is affected by iron deficiency anaemia. Women are more affected as compared to men due to obvious reason such as menorrhagia, polymenorrhagia, Postpartum bleeding etc. More iron is used than intake, but there will be no anaemia, no change in RBC morphology, but iron stores will be low. Stage 2 is called iron-deficient erythropoiesis. 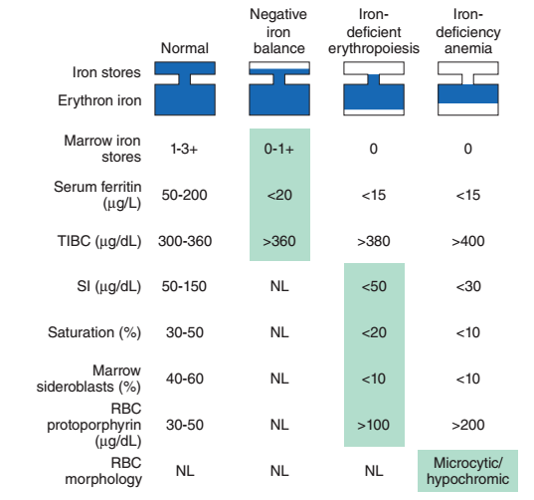 Haemoglobin decreases with hypochromic and microcytic RBC morphology. Diagnosis is simple, serum iron, ferritin and total iron binding capacity are some blood tests that are used to diagnose iron deficiency. On a simple blood complete profile, decreased Mean corpuscular volume (MCV) and Mean corpuscular haemoglobin (MCH) can be seen. Once the iron deficiency is diagnosed, iron is given with the help of any of the following means. 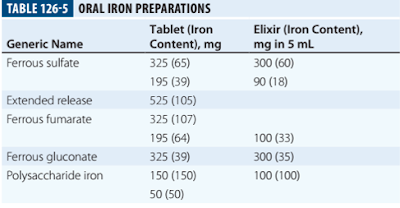 Oran iron therapy is done by giving 200mg of elemental iron per day in the form of 3-4 tablets per day. Oran iron is available in different forms. There is excessive blood loss. "Continue oral iron therapy for atleast six more weeks after you achieve the desired hemoglobin level. This is to replenish the stores or iron. Moreover, oral and parenteral iron has almost similar bioavailability unless there is sever malbsorption or some gastrointestinal pathology, so we may preferable use the oral therapy"